There’s a very subtle, often overlooked thing in Unix, the pipeline, or | character (often just called a pipe). This is perhaps the most important thing in the entire operating system, with the possible exception of the “everything is a file” concept. A pipe allows you to link the output of one program to the input of another. eg foo | bar – this takes the output from foo, and feeds whatever-it-is into bar – rather than, say, having to point bar at a specific file to make it do anything useful. Why are pipes so awesome? I’ve been deliberately vague with the descriptions. Why? Because ‘stuff’ can mean a file – if we specify it, or, it can mean whatever we pass in by putting a pipe in front of it. So here’s an example. The file we’ll use is /usr/share/dict/words – ie, the dictionary. So there’s an additional benefit which is probably obvious. Debugging a complex set of interactions with pipes is incredibly straightforward. You can simply build up what you think you need, experimenting a little at each stage, & viewing the output. When it looks like what you want, you just remove the output-to-screen, and voila! For the end-users, this means that the operating cost of using the system in a complex manner is drastically reduced. Most importantly of all, there is a meta benefit. A combination of all of the above benefits. Pipes enable incredibly complex higher level behaviours to emerge without being designed in. It’s a spontaneous emergent behaviour of the system. There’s no onus on the system development programmers to be demi-gods, all they need to do is tackle one simple problem at a time – display a file, sort a file, and so on. The system as a whole benefits exponentially from every small piece of added functionality, as pipes then enable them to be used in every possible permutation. It’s as if an anthill full of differently talented ants was suddenly building space ships. Perhaps a better bits-vs-atoms metaphor is of money. Specifically the exchange of goods (atoms) for money, allows the conversion of those atoms into other atoms, via money. In the same way, pipes allows different programs to seamlessly interact via streamed data, in infinitely variable ways. You don’t need to know how to make a car, since you can do what you’re good at, get paid, & exchange that money for a car. Or a boat. Or a computer. Society as a whole is vastly better off as each person can specialize & everybody benefits. Think how basic our world would be if we only had things that everybody knew how to build or do. Same thing with computers & pipes. What seems like an almost ridiculously simple concept, pipes, has allowed an unimaginably sophisticated system to emerge from simple, relatively easily built pieces. It’s not quite the holy grail of systems design, but it’s bloody close. This is kindofa ridiculous post, but I Googled & couldn’t find anything, so this is primarily to help other people that might have this problem. Adobe AIR apps will lock up (ie freeze) if you try to click a url (http link) in them and the Windows Installer service isn’t running. I tested this with both in Twhirl (v 0.8.6 & 0.8.7) & Tweetdeck (v0.20b), on Windows 2000 (Win2k) SP4. Typically if you start the service (either through the gui interface, or with a NET START MSISERVER run at dos or from Start-Run) after you’ve clicked a link, it’ll unlock the app.. but not always. I have no idea why AIR needs to have the installer service running in order for it to connect to your browser (frankly I find it both suspicious & more than a little lame), but there we have it. Auto Responders Are Good, Yes? I recently had a very simple task – I wanted to get one of my brokers to send my daily account mails to a different email account. That should be straight forward enough, right? Click the subscription information link, enter a new address, and on with my day? Wooah Nelly, slow down there. So, try the obvious – hit reply & request a change. After two weeks of trying that, time for a new tack. I go to the website listed – a completely different company (it looks like they’ve outsourced their email blasting, which might explain their lack of flexibility) – pick the most likely looking email address I can find, and write a polite email. A week later, still no response. Still getting these more or less useless (but oversized) emails to the wrong account. So, time for a more aggressive approach. I go to the whois registry & get tech & biz contacts. I go to all the related websites. I get EVERY public email address I can find, and mail them all. I am polite – I explain that I realise I’m probably (after all, ONE of them may be the right one so I can’t be 100% certain) emailing the wrong person, but if they could please forward it on.. yadda yadda yadda. I may have also *cough*accidentally*cough* mentioned that the CAN-Spam Act 2003 (yes, it’s an American company) makes it a legal requirement that there be working unsubscribe links available. The fact that I’m emailing vice presidents & CEO’s in five countries I’m less concerned with – if they don’t hear about it, how will this ridiculously trivial problem ever get corrected? I don’t play golf with any of these guys. Frankly I’m amazed that any company has public (& clickable, ie mailto) email addresses on the web considering how bad spam is these days – let alone vaguely high level people, but hey. I get 7 responses, one justifiably aggrieved at being distracted from their Very Important Job. Mostly helpful, one super helpful who finally gets the job done. The only thing worse than posting email addresses publically is posting dead email addresses. Way to misunderestimate the web, guys. But then, I’m guessing if they really ‘got’ the internet, they’d also have an auto-responder by now. I mean really, what’s not to like about that? There’s been a lot of grumping about Cuil lately, so I thought I’d add to it (hopefully in interesting new ways). I’ll talk in context of a site that I have *cough* some familiarity with: galadarling.com (hint: I built & managed it for the last two years). This site gets over 100k uniques a week, has a google pagerank of 6, and a technorati rank in the mid 5000’s. I.e., it’s not Yahoo, but it is a significant, popular smaller site. 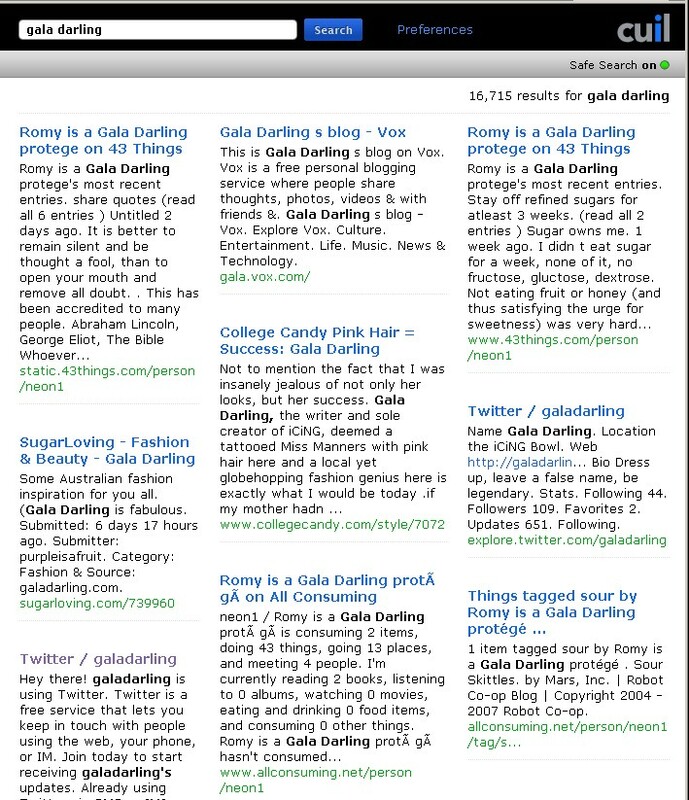 Putting in “gala darling” in quotes (just like that) results in the exact same result set. Huh? Even scarier, putting in galadarling (all one word) doesn’t even return the site. How is this possible? Even worse than that – gala.vox.com is the second returned result. This is a single page that was setup once and then ignored. It’s not just not finding the correct result, it’s actively returning junk. None of these sets include Gala’s livejournal, which is updated every couple of weeks, let alone the actual site that has her name on it. With the exception of her twitter account, all the results on the front page are other sites, talking about her… and this is useful.. how? I looked at the first 20 pages of results – couldn’t find either her livejournal or main site. vox.com somehow managed to get several hundred mentions. A single collegecandy page appeared at least 5 times. Ok, it’s common knowledge that the Cuil results are crap. How about some other things. When you first load the page, you have to actually click to get into the textbox to enter your search terms. When paging through the results, there’s no way to go back to the start, as once you get past page 10, the earlier pages scroll off to the left, so you have to go backwards in chunks of 4 or 5. There’s no way to get more results on a screen. Even on my 1900 pixel wide screen & a tiny font, I still only get 10ish results per page. Google allows me 100 – why should I click-wait-click-wait just to use Cuil? To their credit, Cuil’s bot is not hitting the site anywhere near as much as it used to, so that’s one good thing. Considering galadarling is updated typically once a day, plus maybe a hundred comments, the Cuil bot (twiceler) used to hit the site about a thousand times a day (resulting in it getting blocked by damn near everyone). For comparison, Google’s bots hit it 400 times a day (partly that will be because there is context-sensitive advertising on the site, so Google needs to scan for that). Now Twiceler is visiting about a hundred times a day – much more reasonable given the update frequency. I’ve talked to the guys running Cuil (back when it still had two ‘l’s in its name). They’re obviously very smart cookies and they definitely care about what they do. If they can shake Google up – well, great – and I say that as a Google shareholder. They definitely have a lot of bugs to iron out though, and the reliability of those results needs to be right at the top of the list. Without trust, what do they have? 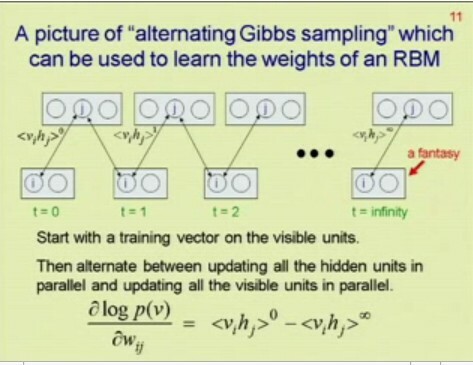 Given that I spent five+ years of my life in the early 90’s doing nothing but eat, drink & dream neural networks, this Google talk by Geoffrey Hinton (one of the giants of nnets) was one of the most stimulating, exciting & thought provoking things I’ve ever seen. Plus he seems like a hell of a nice guy – has a great sense of humour. It is, however, singularly awesome – took him 17 years to figure out, so appreciate it, damn it! In what sequence are intra-bar orders hit? It’s not as straight forward as you’d think. Here’s a problem I spent a while thinking about and solving. It’s quite a core one, and a bit tricky on the edge cases. Some background: I’m building a system trading backtesting engine. Well actually, I’ve finished building it. Now I’m just making it do fun things. Anyway, so, we have a program (a “system”) that decides when to Buy & Sell (ie, places “orders” or “signals”, usually at a specific price) in the market. We then run that against a bunch of market data, and see how well it does. From this we either tweak the system, or trade it. Rinse, Repeat, this is more or less what I do all day. Well, I’m more on the testing side than the development side, but anyway, given the way things are going, that’s largely a moot point. Here is the basic bar – in our case, daily. These are probably familiar to you, but can be a bit weird to start with. The way you interpret these is as follows. The little tick on the left is the Open Price. The tick on the right is the Close price. The line that goes up stops at the High price for the day, and the line that goes down stops at the Low price for the day. All the action happens between those points. However, this bar by itself doesn’t tell us anything about WHAT happened during that day. That’s where things get tricky. So, the key question is – if we have multiple orders on that bar, how do we know which are hit, and in which order? This is important if we are to reliably determine how a system actually trades in the market place. Of course, usually we only have one order per bar, so there is simply a question of “Was the order price within the range of the bar (>= L and <= H)?” If it’s within the range, then the order is hit, if not, not. Very simple1. What order did the Open, High, Low & Close occur in? We don’t actually have any intra bar data, only the O, H, L & C prices. Nothing about which are hit first (although of course O is first, C last). Depending on what we decide, we could end up flat when we should be in a position (or vice versa), or hitting a loss before a profit, thereby significantly affecting system profitability. The cumulative effect of these seemingly insignificant differences can easily result in very nasty “real time” surprises when we’re actually trading a system that may otherwise have tested positively. The higher frequency the system (i.e., the more often it trades), the greater the likelihood of multiple signals on an individual bar. Cumulatively we could end significantly different from how the system will actually behave when traded. b) what do we do when we don’t have, or choose not to use, finer grained data (eg for performance or cost reasons)? My previous testing platform has a very simple policy. The shortest distance gets covered first, regardless of overall market direction. However this simple strategy is flawed. because the distance from O->L is only 2, but the distance from O->H is 2.1. However, this has a total market distance travelled of abs(658.15 – 660.15) + abs(662.25 – 658.15) + abs(658.50 – 662.25) = 2 + 4.1 + 3.75 = 9.85. 660.15 (O) -> 662.25 (H) -> 658.15 (L) -> 658.50 (C). In order to unravel this, we need to figure out, for each possible type of bar, what order the OHLC would have been hit in. We can then “traverse” each leg of the bar in turn – in the above example, we travel from Open up to High, hitting any prices in that range, ranked from lowest to highest. We then travel from High down to Low, hitting any prices in that range, from highest to lowest. Finally we travel from Low up to Close, hitting prices from lowest to highest. Of course, any order hit can also trigger later orders which must also be accounted for and kept track of. This is the simplest situation. The bar has only one leg, and simply traverses directly from O->C, regardless of overall market direction. Slightly more complicated, this bar has two legs. The market first traverses from O->L, then from L->C. Whether the Open is the High, or the Close is the High is irrelevant. As above, the bar has two legs. First from O->H, then from H->C. Overall trend is irrelevant. These bars are relatively simple. Only two legs. On the left, O->H, H->C. On the right, O->L, L->C. This is the controversial bar. In a long, upward bar (as on the left), it is rather unlikely (although not impossible, of course, just unlikely2) that the market would go from O->H, then all the way down to L, then back to C. So, the 3 legs we decide are O->L, then L->H, then H->C. On a downward bar (as on the right), we reverse the order, O->H, H->L, L->C. This is a rather silly bar. No legs to speak of, we just have to check if any orders hit the exact price (O=H=L=C). It’s debatable if anything would have traded, since markets this flat typically mean zero liquidity – i.e., no trades at that price. This is the most complicated case. How do we decide which order the prices were hit in? Above we’ve been using the overall trend of the bar to decide. However, there is no trend here. The market continued downwards to the Low, then reversed, hit the High, then finally settles back at the Close. In other words, there wasn’t enough selling pressure in the market to push to a new low. Note that this is the exact opposite of our usual trend-based decision. Normally if the trend is down, we estimate that the High was hit first. Here we hit the Low first. Of course, if the previous bar was an upward trending bar (C > 0) then we estimate that the High was hit first, then the Low, then Close (ie, O->H->L->C) – in other words, there wasn’t enough buying pressure to push to a Close above the Open. Very occasionally you do get situations where you have several of these types of bars in a row – in which case we look back two bars, etc. Of course, accuracy drops, but fortunately this is rare enough not to worry about too much. Hopefully, by combining all of these decisions, you end up with a much truer picture of what any system is doing, within any given bar. With all backtesting, it’s always a tradeoff of likely accuracy versus effort. How can you be sure you’re not over-optimizing? How can you be sure your system will trade exactly as it has tested? Is it worth the additional effort? Etc. This kind of analysis is just a small step closer to reality, in terms of simulated versus actual performance. Of course, there is also the question of whether our orders would be filled at EXACTLY the High or Low of the bar. i.e., should we use >=L & <=H or >L & <H? The entire strategy will never be 100% correct, of course, because any market will sometimes behave in unexpected ways. What we should attempt to do is get our estimates as close as reasonably possible to reality. More accurate = better informed decisions = greater likelihood of successfully trading systems.